RPM Traxxas Slash 4x4 Front Bumper & Skid Plate, Black Discounts Apply ! 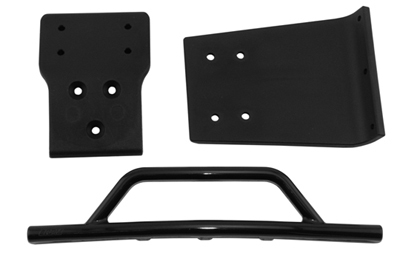 RPM80022 - RPM Traxxas Slash 4x4 Front Bumper & Skid Plate, Black. Our three-piece front bumper/skid plate design for the Traxxas 4x4 is Chrome on Gray Front Bumper & Skid Platesimple, yet strong, effective and highly attractive. We made it a three-piece design to give the Slash owner the option of full front-end bash-proof and crash-proof protection with the skid plate mount, skid plate and bumper installed or if they�re racing, they can remove the bumper and use the skid plate mount and skid plate as a light-weight alternative bumper/skid plate that sheds 27 grams (almost a full ounce) of weight from the front end of the truck. Once the race is over, simply reinstall the bumper and full bash protection is once again available! Black in color.